A minibus belches black smoke; the lorry behind it in the traffic jam billows white fumes. Eyes smart in the smog as diesel gases from thousands of 10 and 15-year-old vehicles fill Nairobi’s hazy evening air, adding to pollution levels that are “beyond imagination”, according to one resident. This jam could last for one, three, even five hours – last year, one stretched for 30 miles. We could easily be in Cairo, Lagos or another African megacity, but this is the eight-lane Mombasa Road in Kenya’s capital – a permanently clogged artery in a metropolis where the number of vehicles doubles every six years. Kenya is one of the few countries in Africa to have banned cars using the most sulphurous fuels, but what research there is suggests this is still one of the most polluted cities in the world – made worse by smoke from roadside rubbish fires, diesel generators and indoor cooking stoves. No one knows for sure, however, because like nearly all African cities, Nairobi does not regularly monitor its urban air quality. 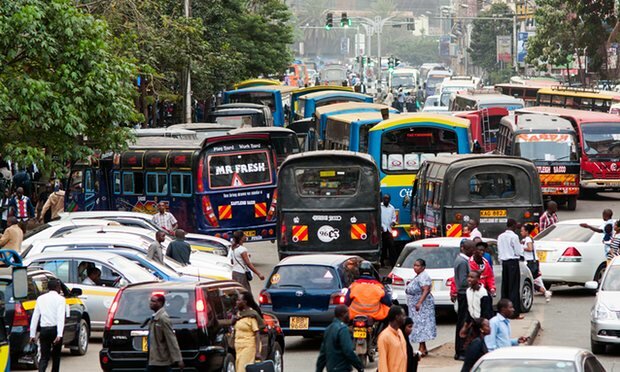 “In 28 years of living in Nairobi, I have seen the number of people quadruple and car ownership go from 5% to 27% of people. The pollution is mind-boggling,” says Dorothy McCormick, a Nairobi university economics researcher and author of books on African transport. Africa’s urban air is especially bad because so few cars are new, the vast majority having been shipped in secondhand from Japan and Europe with their catalytic converters and air filters dismantled. It is in danger of becoming a dumping ground for the world’s old cars – importing vehicles that no longer meet rich countries’ pollution standards. Across the continent, this explosion in car numbers, coupled with people cooking indoors on wood-fired stoves, is creating an urban health crisis already estimated by the UN to be killing 776,000 people a year. If unchecked, within a generation it is likely to kill twice as many annually, with devastating costs to public services and economies. According to Marie Thynell, an urban researcher at Sweden’s Gothenburg University who led a study of Nairobi pollution in 2015, the amount of cancer-causing elements in the air within the city is 10 times higher than the threshold recommended by the World Health Organisation. Thynell’s research uncovered dramatic pollution spikes on all of Nairobi’s main roads. “The pollution is uncontrolled and particularly deadly in slum districts and for drivers, street vendors and traffic police,” she says. In west Africa, the manmade air pollution from the string of coastal cities including Lagos, Accra, Abidjan and Cotonou is now so bad that it is mixing with natural pollutants blown from the Sahara and affecting cloud cover and rainfall, according to Mat Evans, professor of atmospheric chemistry at York University, who is leading a large-scale investigation of air pollution in the region. The WHO highlighted the danger from air pollution last month when it released data on 3,000 cities worldwide. The few African cities which had any public monitoring records all had particulate (PM) levels way over UN guidelines, and four Nigerian cities were among the world’s 20 worst-ranked. Unless action is taken, says the WHO, the continent’s urban air pollution levels could triple or quadruple within 15 years. Onitsha, a commercial hub in eastern Nigeria, had the world’s worst official air quality. A roadside monitor there registered 594 microns/cubic metre of PM10s, and 66 of the more deadly PM2.5s – nearly twice as bad as notoriously polluted cities such as Kabul, Beijing and Tehran, and 30 times worse than London. Evans says that African cities such as Lagos have entirely different problems to London, where “pollution is mainly due to the burning of hydrocarbons for transport that can be addressed by tackling fuel usage through electric vehicles, and car-free zones. “African pollution isn’t like that. There is the burning of rubbish, cooking with inefficient solid fuel stoves, millions of small diesel electricity generators, cars which have had their catalytic converters removed and petrochemical plants, all pushing pollutants into the air over the cities. De Jong advocates the widespread introduction of electric bikes in Africa: “In China there will be 300 million of them by 2020. They are cheaper than petrol – it’s purely a policy and awareness problem. If the Lesotho-U.S. Trade Deal Disappears, Will Women’s Freedom Vanish as Well?